Stuffed masala idli recipe with step by step pics and video, learn how to stuff idli and make soft idli as well. Tips to make perfect idli. Healthy stuffing makes idli more healthier than the normal idlis. Am sure all idli fans would love to have this idli. i made the stuffing bit spicy so that we no need any special chutney or sambar is not required to try this. As it stuffed with veggie we can pack it for lunch also. It doesn’t require more time and you can make and store the stuffing inside the fridge,make idly at anytime.to make soft idli check here how to grind idli batter. Do check the saravana bhavan kara dosai recipe which i posted few weeks before and it is super hit at my home. If you are looking for south indian masala dosai here is the recipe. If you want your stuffing less spicy try this potato masala recipe,it can be stuff in dosai,pori and idli as well. Add 1/3 cup water, cook covered for 5 minutes in low flame (or until veg are cooked). Sprinkle water if its too dry and mix well. Add coriander leaves finally.Once it become dry masala take it out and let it to cool down for sometime.To make stuffed idli (I used my idli dosa batter itself), grease the idly plate and then pour a half laddle of batter and spread evenly. now add a tbsp of masala and drop over the idly batter and then again drop the idly batter over the filling and close it.steam the idli and serve hot. 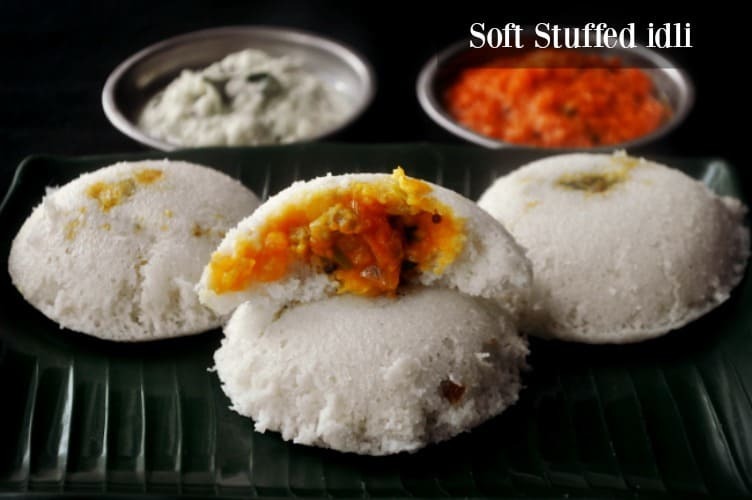 make sure that the idly batter consistency should not be too thick or too thin. stuffing should be thick and not too hot. take out the idly once it completely done. Stuffed masala idli recipe with step by step pics and video, learn how to stuff idli and make soft idli as well. 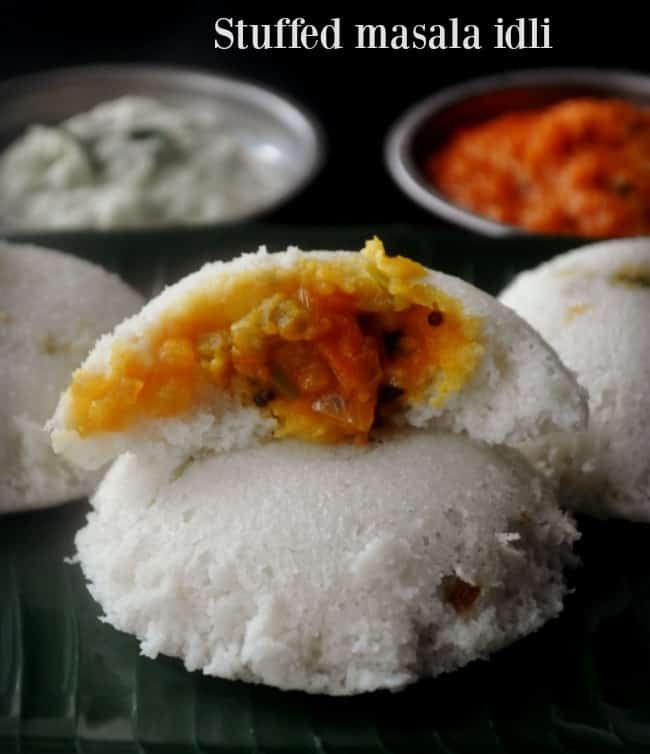 Tips to make perfect idli. Healthy stuffing makes idli more healthier than the normal idlis. Heat a kadai and temper with mustard seeds and spilt urad dal. Add finely chopped onions and tomatoes,fry till transparent. Add capsicum, fry for a minute in medium flame. Add red chilli powder,turmeric and salt. Fry till everything turns mushy and to a masala. Add ⅓ cup water, cook covered for 5 minutes in low flame (or until veg are cooked). Sprinkle water if its too dry and mix well. Add coriander leaves finally.Once it become dry masala take it out and let it to cool down for sometime.To make stuffed idli (I used my idli dosa batter itself), grease the idly plate and then pour a half laddle of batter and spread evenly. Keep posting, All the best !!! Looks tasty. I’m gonna try it today .